I have been mainly concentrating on skin care products for quite some time. 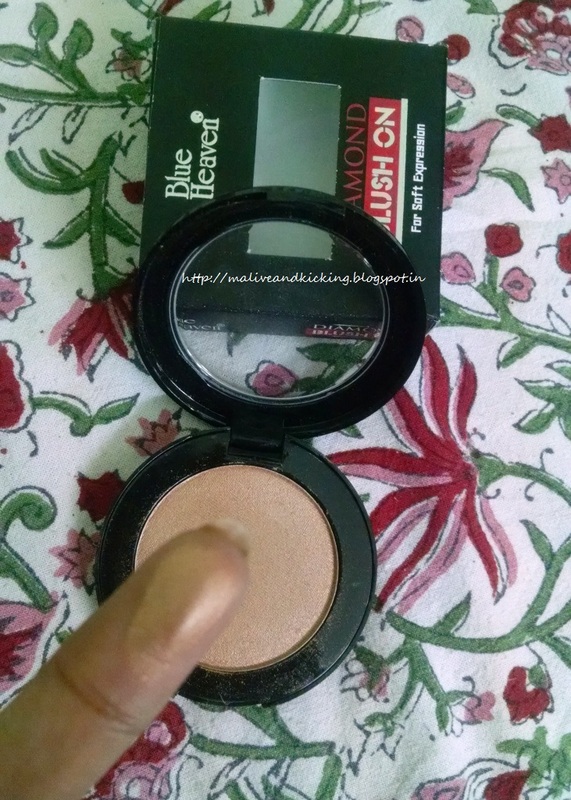 But today is the day as I review a pocket friendly product that is a perfect pick to highlight your cheeks for a glam look. 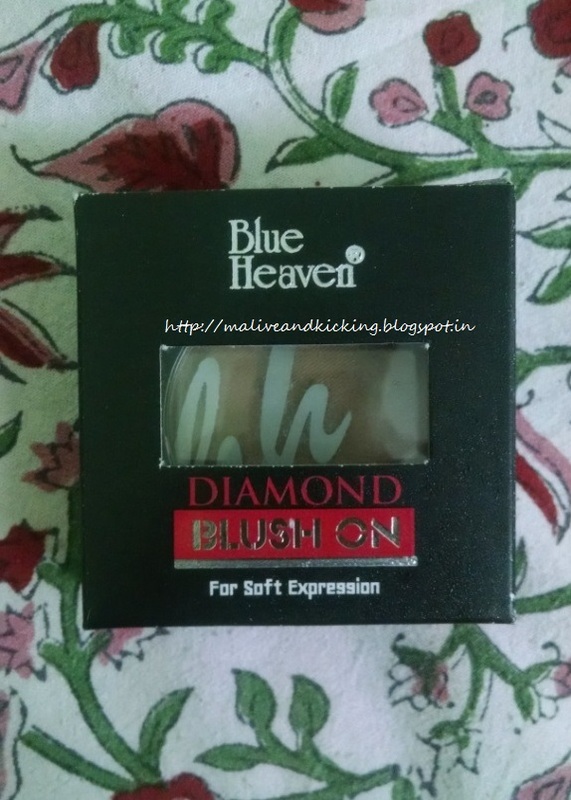 Its none other than Blue Heaven Diamond Blush On that is a must-have in makeup kit of every woman. 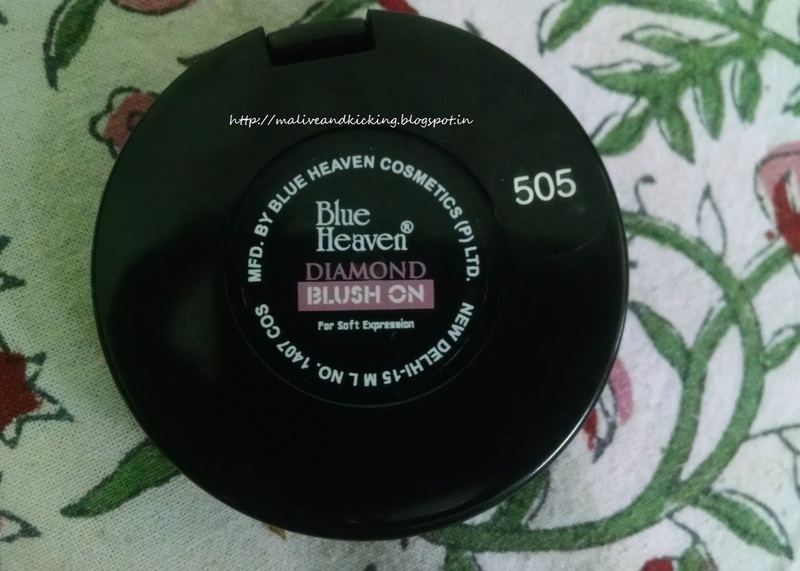 Blue Heaven Diamond Blush On has a soft cream whipped formula that is long lasting and blends very smoothly with your skin.It feels virtually weightless and glides on quickly and easily giving a natural look to your face. Fresh jet milled colour builds to desired intensity. Long wearing and long stay true colors for hours. Key Ingredients: Hydrated Magnesium Silicate, Kaolin, Zinc Stearate, Mica, Titanium Di Oxide, ISO Propyl Meristate, Phenoxy Ethanol, Methyl Paraben, Butyl Paraben, Ethyl Paraben, Propyl Paraben, Isobutyl Paraben, permitted preservatives and perfume. The Diamond Blush On comes in a black round packaging. And the top lid is made of transparent plastic so it makes easy to glance and choose the appropriate shade. There is an outer carton of cardboard which has all details printed on it including price, ingredients, usage method etc. 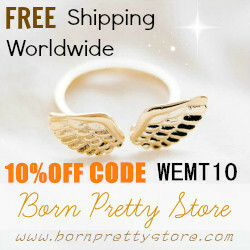 The packaging is easy to hold and carry, so it can be taken with you while travelling. The blushes have been recent addition in my makeup kit n an addiction to me. Earlier I was not so fond of them, feeling it needs great skills to apply and it may not go with my dusky complexion. I got to try Diamond Blush On by Blue Heaven in shade no. 505 which is a golden bronze mix shade. You can check the shade no. at the back side of the blush pack. 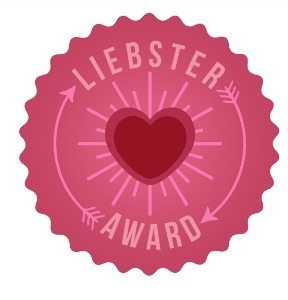 The blush is accompanied with a think applicator sponge that easily lifts the blush on it. The texture of blush is quite smooth. 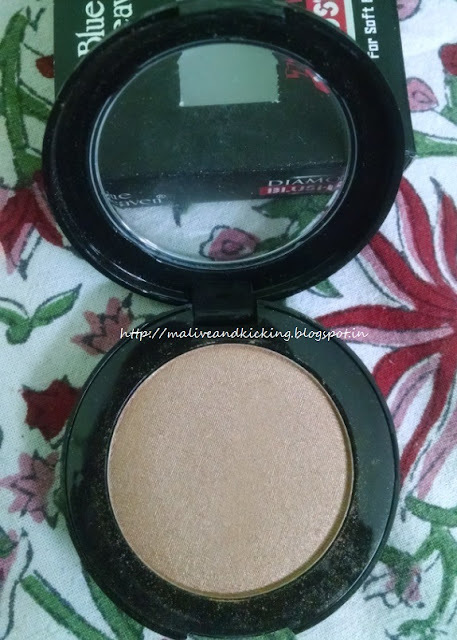 It blends evenly and doesn't show up patchy makeup signs due to its decent pigmentation. You get the desired shade in one or two swipes on your cheeks. This shade of blush contains tiny shimmery particles within that will instantly boost your party look. The shade is suitable to most Indian skin tones. As far as, staying power is concerned, I tried this blush while going for a friendly get together which lasted around 3-4 hrs in the night. The effect of blush beautifully complimented my ethnic look/outfit and it stayed on without fading all the time. I applied it to its soft tone so that it doesn't look awkward for my skin tone, but you may build up the color by layered application or by mixing with other shades. 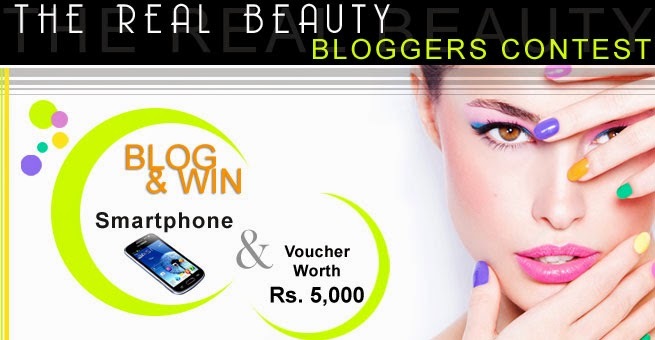 The only requisite is to blend it properly along your cheekbones and enjoy compliments for your pro makeup. Not to forget, that the blush has slight strong perfume which I feel was not required or could have been diluted to milder one. Gives shimmery radiance to cheek for lovely night look. Suited for most skin tones. Wish the packaging can be improvised by adding a tiny mirror to it. 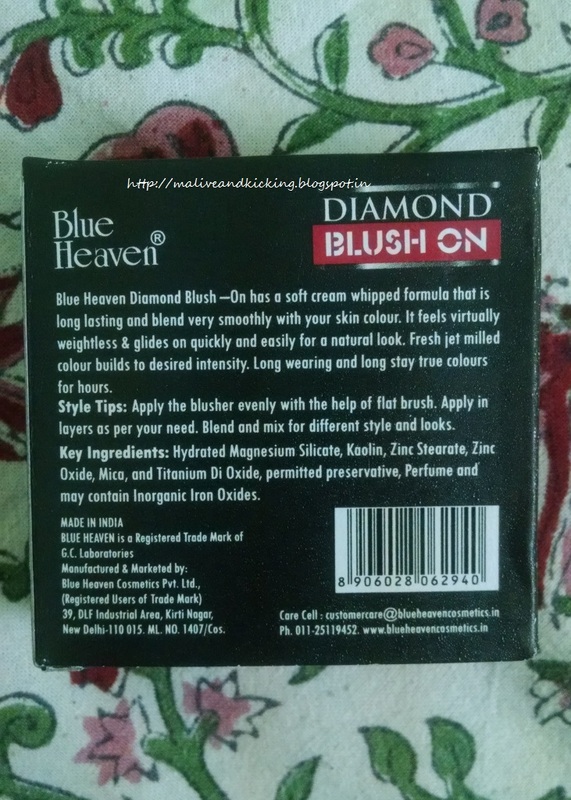 Contains Parabens (which are there in most blushes). Perfume may be stronger for some. 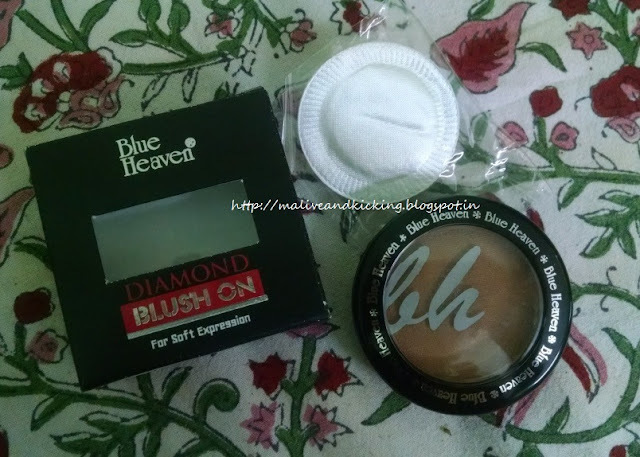 Blue Heaven Diamond Blush On is a nice product ideal for intensifying your day look or evening party look. The light price tag makes the product even much better. The only con is that it has parabens which I usually find in the blushes of many expensive brands too. So I am satisfied to pretty good extent with the product. I have this in different shade. It is not much pigmented but the color is buildable. 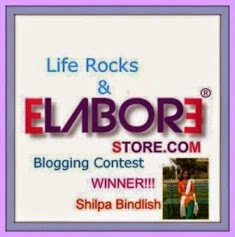 can u make a review on shade no 502? Yes, it can be used for parties as well. Thanks for stopping by. Absolutely wonderful idea. One should not limit to one single usage of a product and should experiment in varied ways.